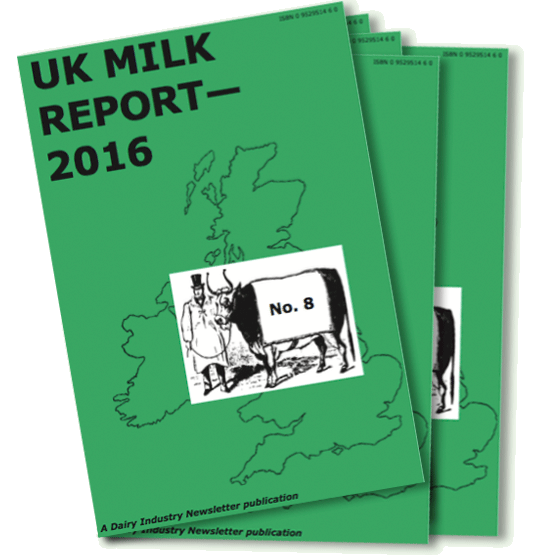 Dairy Industry Newsletter’s UK MILK REPORT—2016 is now available. This is the eighth edition of DIN’s UK dairy directory, and the first edition for eight years. • Fully updated profiles of over 200 companies operating in the UK dairy industry (see below). • Analysis of eight years of takeovers, mergers and collapses. • Analysis of 35yrs of UK milk prices, latest UK milk price league table and European milk price comparisons, including comprehensive LTO EU price analysis. • Analysis of the structure of UK milk processing. • Update of the CAP dairy system, markets, dairy farming and UK dairy trade. First Class postage included. Available from April 25.